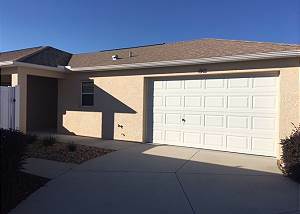 The Villages, Florida United States - THE VILLAGES COURTYARD VILLA WITH CART | RE/MAX PREMIER REALTY Inc.
Beautiful three bedroom (only two beds) two bath courtyard villa available! Master bedroom with a king size bed and a flat screen TV, master bath has a walk in shower. Large flat screen TV in the living area with plenty of comfortable seating. Guest bedroom has a queen bed with small TV, and the third bedroom is set up as an office/den. Dining area seats 6. This home has everything you need including a golf cart! A guest from Wadley, GA United States recommends this vacation rental. A guest from Demotte, IN United States recommends this vacation rental. For the price of an average hotel room you get a beautiful 3 bedroom (actually 2 bedroom 3rd set up as an office) home. It's beautifully furnished and comes with an awesome golf cart. Tons of activities to do in The Villages. Great golf. Thank you for your kind words. We're glad you enjoyed your stay and look forward to helping you in the future!